The lands and waters of the Great lakes are like no other place, and offer some of the most majestic natural landscapes on the planet. The environment of the Great Lakes includes more than 16,000 km of coastline, about one-fifth of the world’s freshwater supply, and is home to more than 200 globally rare plants and animals, including 40 species found nowhere else in the world. 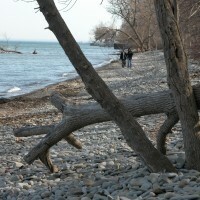 The shoreline of Lake Ontario is a “bioregional corridor”, similar to the Oak Ridges Moraine or the Niagara Escarpment, and serves an important role in providing habitat and migration routes for wildlife. Species travel along the shoreline, but also use it as a resting area before traveling north to breeding areas in the Boreal forest, or south to overwintering areas in the southern United States and Central/South America. The Lake Ontario shoreline is important locally, and lake-wide to the people, plants, and animals living in the water and nearby. CVC is undertaking a Lake Ontario Integrated Shoreline Strategy (LOISS) to help our community better understand our lake and shoreline, and to find ways to protect and restore it. Living by the Lake is a newsletter exclusively for residents, businesses and institutions near the lakeshore in Mississauga. It highlights environmental issues and opportunities, and showcases local residents and businesses that are doing their part for the community.